Why? 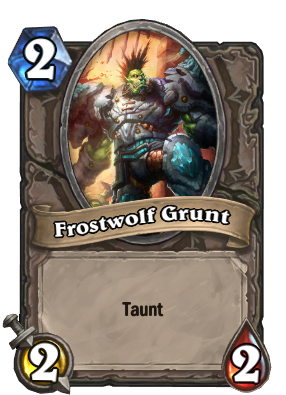 He was an overrated otk combo piece in all aggro based control decks mostly used in priest. This is the most unimpressive card in the game. Regardless, a forgettable card. Asides from a meh drop from Piloted Shredder, or a very disappointing Unstable Portal, you'll be seeing this guy less and less the more you progress. EDIT: Alas, poor Grunt, now even Pompous Thespian has been added to further your unpopularity.